Richmond trusts Aarrow Transmission for quality transmission service, auto repairs, rebuilds, and replacements. Our ASE-certified mechanics can expertly service any transmission – standard or automatic, foreign or domestic, old-school to cutting-edge vehicles. If you have a transmission problem, you’ll be pleased to know we have auto repair shops in both South Richmond-Midlothian and Glen Allen-Short Pump. Proper transmission service matters – especially when you consider that low fluid is the root cause of most transmission problems. Sometimes changing the transmission fluid is enough to solve the problem. Most of the time, we’ll need to repair the cause of the loss in fluid – or the damage caused by it. Diagnosing a transmission problem is both an art and a science. So, in addition to using the latest computerized diagnostic equipment, we’ll always ask a series of thoughtful questions and then perform an extensive road test. We always check the communications link between the engine and transmission. Our careful review of cables, vacuum lines, electric sensors, and switches helps us to eliminate clutch and shifting malfunctions. 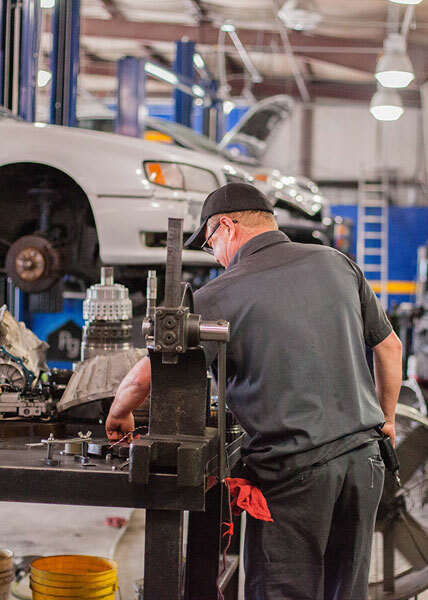 Next time you need expert transmission service, count on Aarrow Transmission; chances are, some of your Richmond friends and neighbors already do. Our name says it all: Transmissions are our specialty. Call Aarrow Transmission today at 804-794-2400 (South Richmond-Midlothian) or 804-364-2500 (Glen Allen-Short Pump) to schedule a friendly, reliable transmission service, repair, rebuild, or replacement. Richmond trusts Aarrow Transmission for quality transmission repairs, rebuilds, and service. Our ASE-certified mechanics can expertly service any transmission – standard or automatic, foreign or domestic, in everything from old-school classics to the most cutting-edge cars on the road. We’re also conveniently located. If you have a transmission problem, you’ll be pleased to know we have repair shops in both South Richmond-Midlothian and Glen Allen-Short Pump. So, what keeps Richmond coming back to Aarrow Transmission for service and repairs? In addition to our factory-trained technicians, we offer excellent preliminary diagnostics and quality parts. And we take genuine pride in the work we do. Whether we need to replace your transmission or rebuild the one you’ve already got, you can count on us to move quickly and efficiently. We strive to do every job right – the first time – and get you back on the road as soon as possible. Diagnosing a transmission problem is both an art and a science. So, in addition to using the latest computer diagnostic equipment, we'll always ask thoughtful questions and perform a road test. Transmissions require the right amount of fluid. Too little may result in a leak which can cause serious damage to your transmission. Also too much fluid can cause foaming which can cause band or clutch failure. Our technicians are able to understand the condition of your transmission by looking at the color. They can then determine the cause and severity and even how the transmission should be repaired. We always check the communications link between the engine and transmission. By careful review of cables, vacuum lines, electric sensors, and switches we are able to eliminate clutch and shifting malfunctions. All cars have electronic controls that send and receive information which affects the performance of the engine and transmission. Our tests will tell us if these controls are working properly or if they are apart of the problem. We make sure to keep accurately document the performance and condition of your transmission. This helps us know when to order parts, service as needed and keep your car running smoother longer. Whether it's a simple filter for routine maintenance, or a new clutch needs to be ordered to rebuild your transmission, we are your experts. No matter the part you need, it will be installed by a factory-trained, ASE-certified technician.